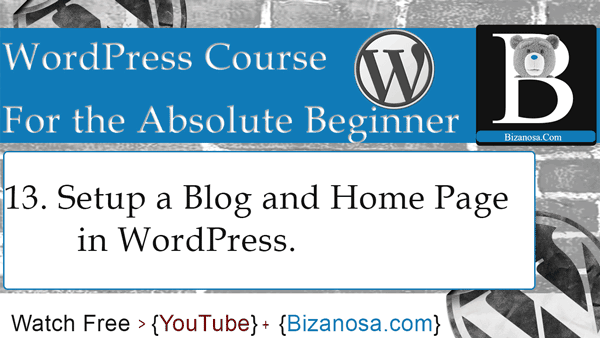 Hi and Welcome back to this Bizanosa WordPress course. In this video we want to make this the Blog page so that all the wordpress blog items can be listed under there. And this becomes the home page. So, to do that, let’s go into settings. Then we go into reading. And it will be as easy as setting this Front page as a static page . Then the Front page, we will attribute that to the Home Page . And the posts page, we will attribute that to the Blog page. Then we’ll come here and save changes. And just with that, if we go and visit our website, we will see that the home page is set to or Home Page page . As you remember, I was adding featured images and you can see the WordPress 2015 Theme is using our featured image as the Header image for that particular page. In the home page if we go back to the home page , you will see that this was the featured image for the home page. We haven’t created a Menu yet. We will get to that. Right now we want to go to the blog page. And we will do that by going to…wpforbeginners/blog. So here is our blog page. And you can see it is listing all of our posts . Once we create the menu , this would be the blog page , so you’d just link this as the blog page. That’s it for this video . In the next video we are going to create our menu. So that it becomes easier to navigate through the website. Okay. See you in that video about WordPress Menus.